Pet lovers can now borrow pets from other owners for just a few hours at a time with Bark N Borrow. Love dogs, but don’t have the time, space, or money to own one? If so, there’s a service that lets you borrow a dog at your very own convenience—sort of like renting a movie, you know, if that still happened. 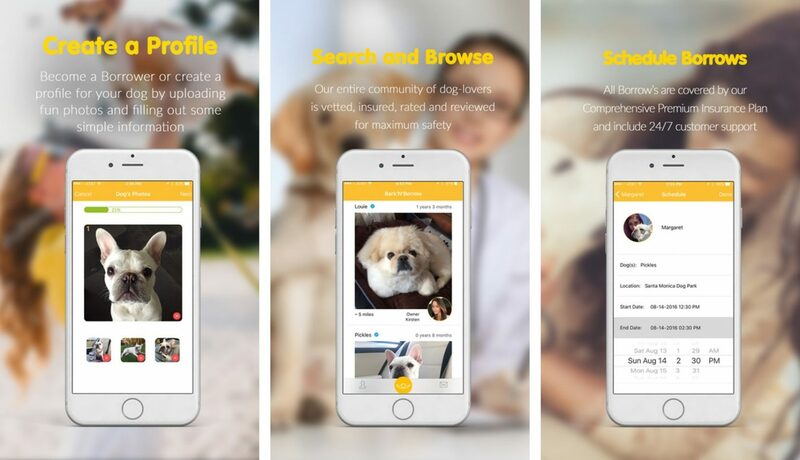 Bark’N’Borrow, a startup that has been around since 2014, is a marketplace for doggie dates; the app connects people who want to hang out with a dog, take one for a walk, or borrow one for an overnight stay with people willing to temporarily part from their pooch. The community is approaching triple digits, having recently cracked the 70,000 user mark. The main selling point of the service for owners is that they can have someone watch their pet without having to pay extravagant fees for “professional services.” In fact, the sitters and borrowers aren’t paid any fees for their efforts at all; it’s all for the love of the fur. In addition to the main service, however, there is a premium offering where owners can pay a fee for time with a professional dog walker/sitter. Founder Liam Berkeley started the service a few years back when he and his girlfriend wanted a dog but couldn’t fully commit to the responsibility of permanent ownership. Acknowledging that there are probably a lot of people in the same situation—right alongside owners who have busy lives and hate the thought of leaving their dogs alone all the time—they threw together a marketplace. Then there’s the aesthetic angle too; in a conversation with Forbes, Berkeley noted that, “It’s well documented that people seen with an animal are viewed more positively. We make this fundamental attribution error that if your dog likes you, you’re a better person.” Of course the word, “your” can be applied generously within today’s economy. To get started with Bark’N’Borrow as an owner, users create a profile by uploading photos and adding a bit of information about their dog, then verify their information with their credit card—each user is also required to provide personal information as well, including email, phone number, zip code and a photo of themselves. In addition to this information, users are also required to answer a set of questions about their dog and some additional preferences they have in the people who may be spending time with their pets. After the signup process, the Bark’N’Borrow safety team vets each user and reviews their profile before making them and their dog accessible to Borrowers. Bark’N’Borrow costs $7.99 for one month with a free one-week trial, or $4.99/month for three months. Both options include unlimited messaging between users and unlimited dog dates. With the service comes comprehensive insurance ($2 million in general liability, $1 million in personal and advertising injury, $100,000 in damage to premises rented to you, and $5,000 in medical expenses, less a $500 deductible). As an app all about showing care for the K9s, 5% of the dues paid by users goes to the Best Friends Animal Society, a national animal welfare nonprofit organization. Currently, Bark’N’Borrow is only available for iOS users, with coverage in most of the USA and parts of Canada. Dogs are great and lets be honest, much nicer than cats. Is that why we don’t see a “Cat Share” program out there? That is a ton of insurance coverage for something like this. I wonder how the startup is able to afford the costs with just monthly sub revenue. I think that having the insurance is what makes this work. Very cool. Pet owners are always trying to get others to be pet owners, so what a great way to trial a pet before you buy one?